He is the author of 3 books: “Experimental Music” (co-authored with Leonard Isaacson), “Principles of Chemistry” (co-authored with Rolfe H. Herter) and “Informationstheorie und Computermusik” and some 60 articles in chemistry, music, electronics, and so forth; he also composed some 50 scores in all media: instrumental, electronic, computer generated, for theater, film and TV. 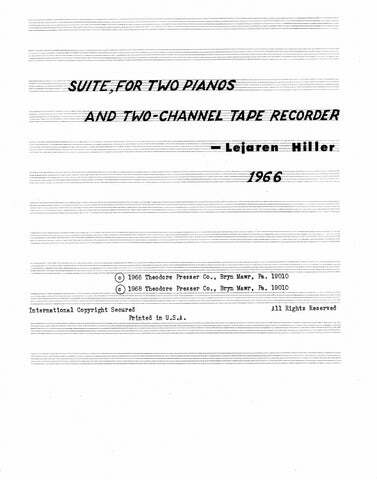 Lejaren Hiller died in 1994.
for Chamber Ensemble 36:00 1 1 1 1 – 1 1 1 0; 2Perc. Gtr. Cb. 14:00 3 3 3 3 – 4 4 3 1; Timp. 3Perc. Hp. Str. 35:00 3 3 3 3 – 4 2 3 1; Timp. Perc. Str.